The only way I can think to tell this story is to tell it from my side of things. I hope that’s a good enough account for today. It was another rough night. Emerson woke up at 2 AM and Dad rocked her back to a restful state. As I laid her down in her crib, I was hopeful for a smooth rest of the night. My 20-30 minutes with her wasn’t enough. Jess got up soon after and was soothing the child until 3 AM before bringing her into our bed. We didn’t really know what was wrong with her. Emmy Kate hasn’t been feeling great, often tugging at her ear and clearly with a productive cough, to use our pediatrician’s term. But she didn’t have an ear infection at the doctor a week ago, and we’re still waiting on her ear tube surgery in 3 weeks. So, as tired parents, we just snuggle her in and give her some over-the-counter meds if she is starting to get a fever or seems like she’s in pain. Last night was no different. Ibuprofen at 3:30 AM or maybe 4 AM. Then I pulled her into my chest and snuggled her in for a few hours of sleep and sweat. Poor girl sweats like her dad. Our morning routine was typical. Jess and I trading off duties while getting ready for work. Emerson does best in the mornings when she’s given tasks, like helping feed the Millie cat or making “go juice” for the parents. Halfway through Jess’s makeup, it’s school clothes, hair done and a little school song as dad frantically looks for Mr. Goat and a muh-muh for the ride to her day care. The drop off was typical too. A little later this morning on account of the sleepless night, but just a quick separation anxiety moment, a goodbye kiss, and away I was. My day was ordinary. A few work-related items and then a meeting at one of the big volume homebuilder companies. I was texting Jess at 10:57 AM as I walked into my meeting. My phone was in my suit jacket pocket, on silent, to where I couldn’t hear or feel the vibration. As I said my goodbyes to the owner of the homebuilding company, we reminisced on the last meeting he no-showed when his daughter had an emergency. My exact words, “Hey, don’t worry about it. Family comes first. If that happened to me, I’d have missed the meeting too.” I entered the elevator. As most people do these days, I looked at my phone during the familiar dings of the elevator counting down to level L. By the second ding, I see 16 texts, 4 missed calls and 2 voicemails. There a sinking feeling in my stomach and those metal doors can’t slide open fast enough. I don’t look at the texts, I don’t listen to the voicemail, I just call my wife. Jess picks up the phone and has a calm-but-concerned voice for me explaining that she’s in the ER, stable, she collapsed, etc. Those next words will haunt my dreams. “Emerson. Your daughter.” I could have dropped to my knees, but my need to get to the hospital was greater than any weakness my soul felt. Our daughter had a seizure at daycare. Speeding down I-35 on my way to Children’s Hospital took my mind back to the last time I was flying through traffic to a Dallas hospital. That time it was my dad being pulled off a Southwest Airlines flight after suffering 6 seizures during the trip from Houston to Dallas. I almost passed out on the way there. When I got there, the nurses had to tend to me just as much as my dad as I laid on the floor of a trauma 1 center trying not to slip into unconsciousness. This feeling, the uncertainty of my daughter’s condition, was a different level. Worried sick wasn’t the term. Frightened, angry, willingness to run over anyone in my way. Those are the terms that would best describe what I felt as traffic moved in slow motion around me. Dad just needed to see his daughter. Tears welled in my eyes. A febrile seizure is caused by a sudden spike in body temperature, often brought on by an underlying infection. The three infections our ER team suspected were ear, upper respiratory or urinary. They would test for all of them while we waited. These droves of scrub-clad people walk in and speak in muppet voice over the beeps of the vitals machine as Jess is listening, and I’m just staring at my wife and my daughter in silence. I don’t know how to be nice or cordial right now. I don’t know how to listen. I hate hospitals. As I think of what her favorite teacher might have gone through in those moments when Emerson went from fun to tired to limp to convulsing, I think back to watching my dad’s first seizure. How chilling it must have been to watch and hold this 22 pound human being go through such an episode. It’s hard to think about. The tears threaten my eyes again. Blood work was done by the time I was there. Two of Emerson’s teachers went to the hospital with her. That place really cares. Jess showed up soon after and dad was there once he figured out what was going on. A quick ear exam with us in the room and then one more to go. Nurses treat patients like people. Doctors treat patients like cattle. So when the first year resident told the nurse she was going to perform the test for the urinary tract infection, I was immediately concerned. As I watched her fumble through the opening of the test packet, not knowing which hand was supposed to be the “clean” hand, and then continue to be step-by-step instructed on how to perform the procedure properly from the attending nurse, I look at Jess and can see she’s biting her tongue. As if our child hasn’t suffered enough, and as she’s being forced down to the paper sheet-topped vinyl bed, I try to look away. 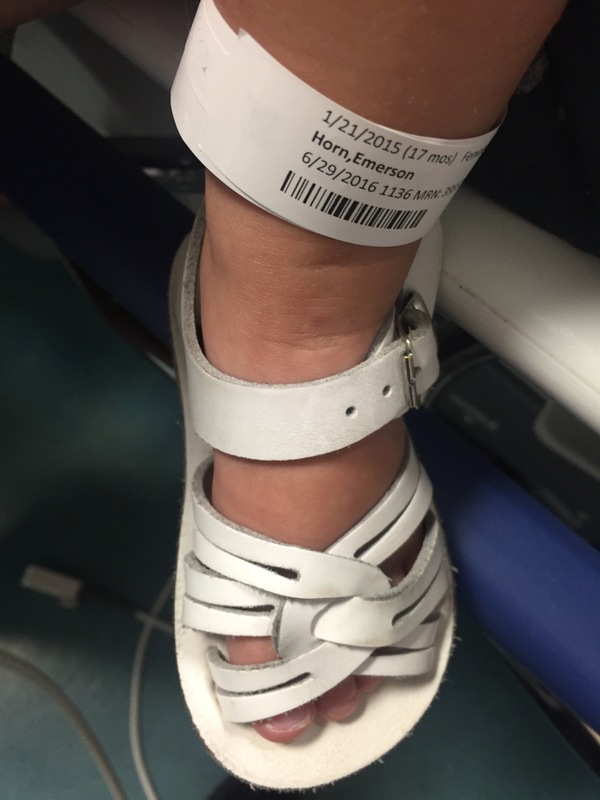 As this resident doctor finishes up, over the screams of our sweet daughter, she asks the nurse if she needs to scan some code undoubtedly the proverbial ear tag of our little calf she’s just branded. All the while Jess and I are trying to get a diaper back on this child, console her and clean her up as she’s now peeing freely on the bed and we’re in parent crisis mode, this rookie doctor just stands idly by ignoring the humans next, punching away on this scanner more concerned with the insurance claim than actually helping us. She walks out of the room, proudly, without a word to either of us. Three and a half hours later, we are released. There’s nothing you can do to stop a seizure but to prevent the symptoms. Against our wishes, another doctor, the third or fourth in this short time, orders her antibiotics, which our pediatrician has told us she can’t take anymore. Another herd out the door. It’s scary to have your child go through that and frustrating to be in a place where no one listens to you but the nurse staff. But at the end of the day, Emerson was back to her normal, happy, beautiful self. Full of life, laughter, love for a kitty (and maybe some for her parents if there’s any left), and just plain fun. Jess and I opened a bottle of our wine from France. I told her I wanted to save it for a celebration. So tonight, we celebrated our daughter’s life.